Do you have an inner performer lurking just below the surface -- or has your inner performer burst above the surface, resolutely refusing to ever be ignored? My guest this week is the fantastic Jeffery Self, who has for his entire life been every inch an entertainer -- whether forming a rebel theater troupe as a teen in his small southern hometown; testing his capacity for sass in the various TV roles where you've probably seen him; and creating the books and shows and circle of friends that he knew he needed in his life. Also, just a quick announcement: after two years of doing this podcast, The Sewers of Paris is finally on Twitter and Facebook. Follow @SewersOfParis and search for the Sewers of Paris Facebook page. I'll be posting video clips of stuff we talked about, previews of upcoming episodes, answering questions and listening to your feedback. And big thanks to brand new patrons James, Joe, Kyi, Mark, and Grant. 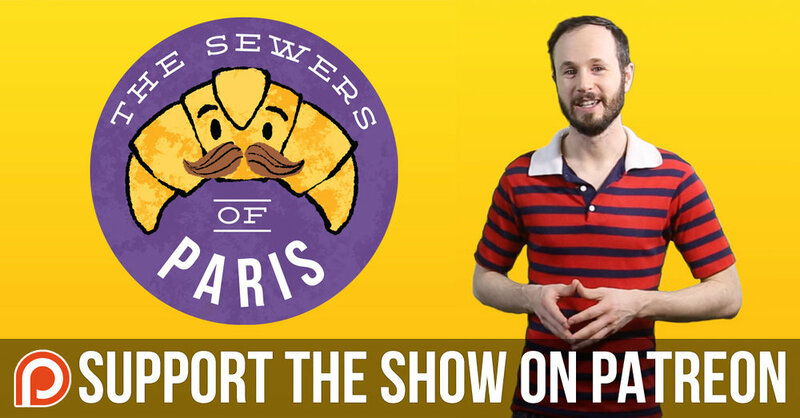 The Sewers of Paris is independent and ad-free thanks to the folks supporting the show with a dollar or more per episode. If you like to listen, you can join them by going to SewersOfParis.com and clicking "support the show on Patreon." There are always approximately five billion interesting Jeffery Self projects happening at any particular time -- his book Drag Teen is currently being made into a musical, he's also occasionally the host of a wildly popular show on Facebook called Jeffery Live, and he was also recently on Drew Droege's magnificent podcast Minor Revelations. There is simply no end to Jeffery's capacity to entertain, and I'm so grateful he has the platform he does to share it with us. But not every great artist needs a large audience. For my recommendation this week, check out the documentary Waiting for Guffman, the one-hundred-percent definitely-true story of a small-town theater troupe that comes together against incredible odds to discover the performer within. The documentary follows a man who looks uncannily like Christopher Guest, and chronicles the staging of a sesqui-centennial show for the town of Blaine, Missouri. Cast in the musical revue are local travel agents, a Dairy Queen queen, a taxidermist, a dentist, and a fancy choreographer who assures us he has a wife, though we never seem to see her. And sure, their performance is goofy and hilarious. But as the town dentist who looks a lot like Eugene Levy says, the experience has taught him something he was never quite sure of before: that he does have talent. Our talents might not be what we expected, they might not be what we wanted, and they might not make sense to everyone who sees them. But when you do find something that you can do, something that you love, there's no greater feeling than letting that talent run wild, and refusing to wait for anyone.